The Garden of Heaven concept was imported from Persia by the Mughals in the form of Timurid Garden. They were the first architectural expression of the new empire created on the Indian subcontinent, and they fulfilled various functions with strong symbolic meanings. The symbolism of these gardens is derived from mystical Islamic texts describing paradise as a garden filled with abundant trees, flowers and plants, water playing a key role: In Paradise (according to Islam) four rivers flow from from a central point, on the mountain. In their ideal form, they are arranged in a square divided into four equal parts. 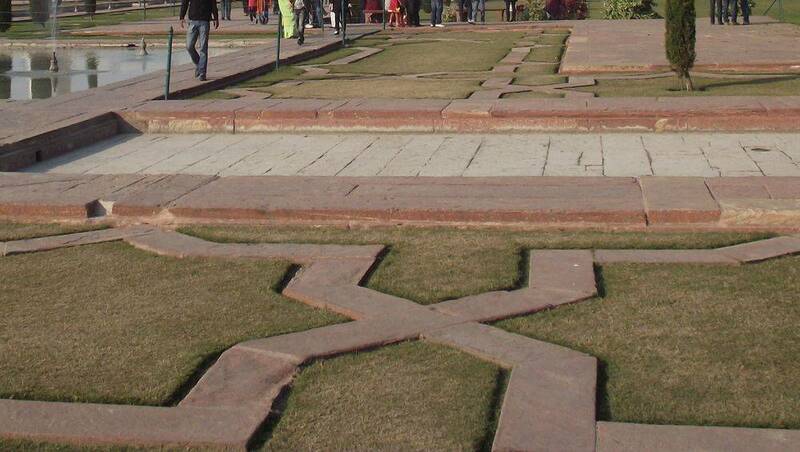 These rivers are often represented in the Mughal gardens (charbagh) by shallow channels separating the garden in four parts and whose perspectives follow the cardinal points. The canals are a representation of the promise of water, milk, wine and honey. 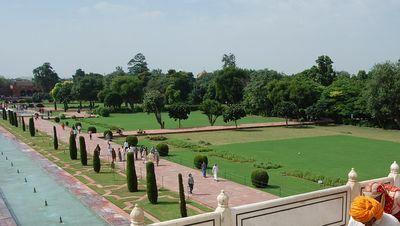 In the center of these gardens, at the intersection of the divisions, there is the main pavilion or, in the case of the Taj Mahal, a basin marking the holiest place of the place. 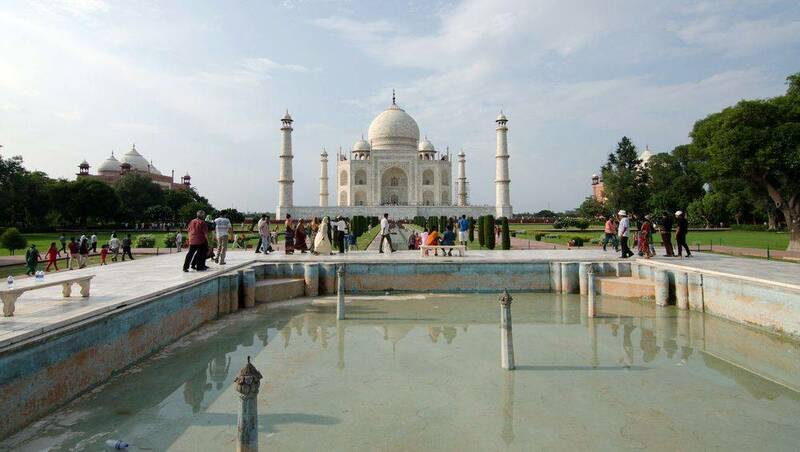 In the very special case of the Taj Mahal this pavilion has been postponed in the garden and replaced by a pond. The tombs of Humayun, Akbar and Jahangir, the previous Mughal emperors, follow this pattern. The cross-shaped axial garden also finds precedents within Southeast Asia dating back to the fifth century in which the Royal Gardens of Sigiriya (now Sri Lanka) have been arranged in a similar way. Why is the Taj Mahal not willing like other Mughal gardens? For the grave of the late wife of Shah Jahan however, where the mausoleum is located at the edge of the garden, there is a debate among researchers as to why the shape of the traditional garden was not used. Ebba Koch suggests that a variant of charbagh has been used; that of the seaside garden, more secular. It is suitable for religious ceremonies. These gardens were developed by the Mughals to meet the specific conditions of the Indian plains where slow-flowing rivers provide the source of water, the water being raised from the river by mechanical devices with animal traction. The water thus entrained and stored in basins. A linear terrace is located near the riverbank with low level rooms set below the main building opening on the river. Both ends of the terrace have been underlined with towers. This form was brought to Agra by Babur and later by Shah Jahan. Other models of charbagh are more traditional, they line both sides of the Yamuna River. The River Terrace has been designed to enhance the views of Agra for the Imperial Elite who travels in and around the city by the river. Other researchers suggest another explanation for the original layout of the mausoleum. If the midnight garden, located north of the Yamuna River, is considered an integral part of the complex, the mausoleum can be interpreted as being at the center of a garden divided by a real river and can therefore be considered more in the tradition of a charbagh said "normal". It is conceivable too. The gardens of the Taj Mahal are four in number because, as indicated above, they form a perfect square divided into four by channels representing the four rivers of Paradise, channels oriented towards the four cardinal points. The square is 300m wide. The central part is highly symbolic, here it is composed of a terrace and a large marble fountain. Each sector is divided into 4 by perfectly straight secondary roads, delineating 16 lawns sometimes dotted with flowers, trees, groves perfectly controlled. In this they resemble French gardens, far from what the future English invader can offer. But the story will make a link between different eras since the Mogul garden model was imported at the beginning of the 16th century by Bâbur, it was an Islamic model with a Persian tendency. This model consisted of making the gardens more rectilinear, orderly, to bring nature to life. This is exactly what the French did in the eighteenth century, although they were not constrained by religious influences, which was the case for the Mughals. But at the end of the nineteenth century, the British took control of the Indies, effectively overthrowing the Mughal dynasty created by Babur four centuries earlier. 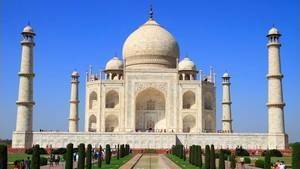 They who had gardens reproducing the nature, it would have been normal that they transform that of the Taj Mahal but it was not the case. On the one hand because by doing this, they would most likely have had the local population back, and then because the English gardens reproduce a nature but doptée, whose forms are controlled, which ultimately was not not so far from that of the spirit of the Taj Mahal. The English influence was felt, but weakly. They pulled out a good part of the trees to enlarge these impeccable lawns. They have remained. The central part of the Taj Mahal Gardens is named "Al Hawd al-Kawthar", which literally means "Cistern of Abundance", or the beautiful "Basin of Abundance". This basin is made of marble, it is supposed to soothe the thirst of those who arrive in paradise. There are 5 fountains in this pool, one at each corner and a fifth in the center. The corner decorations are floral, like everywhere on the Taj Mahal. Remember that Islam does not offer human representation, the representation of plants and flowers is a paradise, or it is in the gardens that we find. The fountain is also equipped with 4 marble benches placed face to face on each side of the fountain. They were added by Lord Curzon in 1907-1908, during the English rule over India. According to the Muslim religion, gardens are a representation of Paradise. Why would a garden be a paradise? Simply because in the 17th century in India, the climate was arid and a garden was a source of freshness, besides a garden is also nourishing. For the inhabitants of this time and place, a garden was therefore a great happiness that could symbolize Paradise. Moreover, the Arab civilization, a provider of Islam, came from a desert region, so water was a symbol of life. This is why there are many fountains or water bodies in a symbolic place of Islam, or even a luxurious place. Similarly, the cypress is a symbol of mourning in the Muslim tradition, that's why we find it on the spot.